Happy Spring from along the front range. The crocus that bloomed last week are covered in a fresh blanket of snow. The great thing about getting a big snow here is it doesn't stay around for long. That's not stopping us from thinking about warm weather and flowers. We have lots of rabbits in our yard so anything we plant is at risk of becoming their dinner. 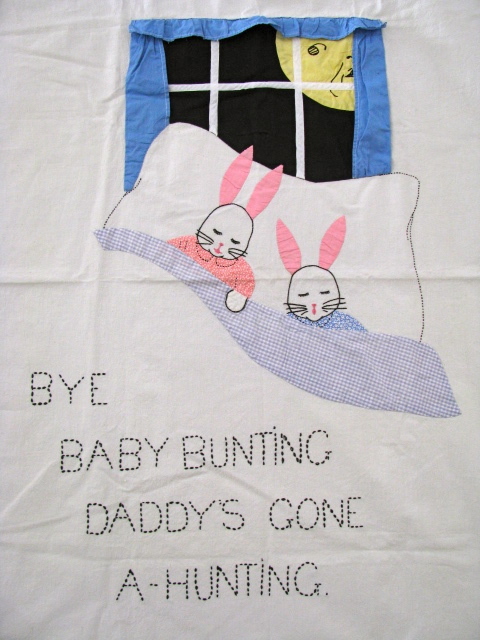 This vintage applique crib sheet is hand stitched. I told here I had never seen the Singer Eggs in the US. I still haven't, but I have found a few sewing eggs. I'm pretty sure the gold egg is good luck! Here are the eggs opened. The gold egg holds a velvet pin cushion with a tape measure in the bottom. The thimble sits atop the cushion with a little clamp. 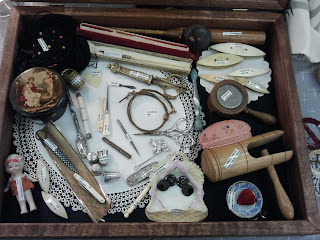 The red egg is a mending kit complete with thread, needle and thimble - no brand. The egg might be a painted milk glass darning egg - more research needed on it. Happy spring or fall depending where you live! This blue work quilt is one of the items I bought on a recent antique shopping adventure. 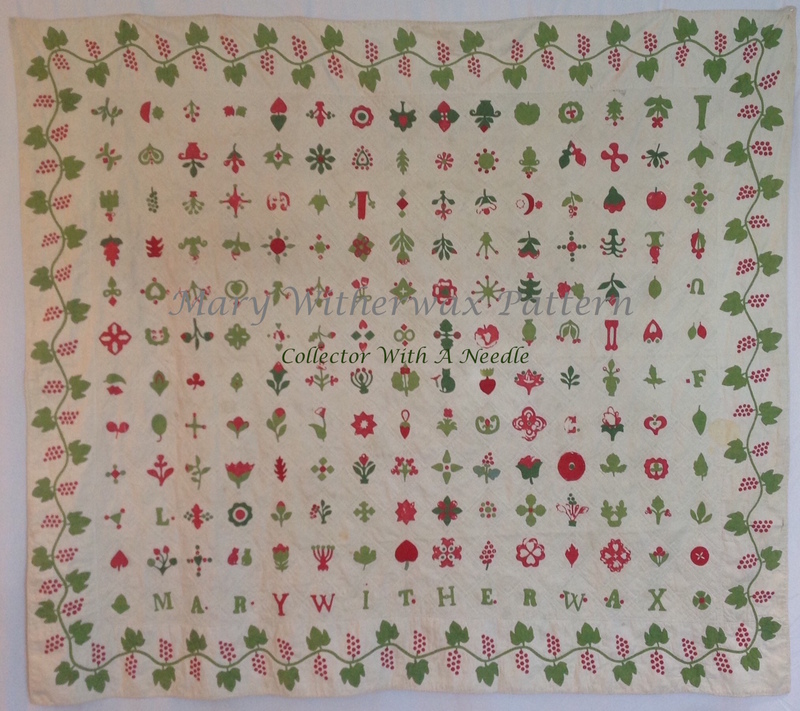 See update below - identified as a Ruby Short McKim quilt! Each block is 7.5" with an outer 7" border. The embroidered blocks each have an inked description. The lower right 'final block' is dated 1927. The quilt is bound in applied cream fabric that matches the backing. The blocks in the first column have a roman numeral inked with the description as if following chapters, maybe a history book? Or 4 quarters of a school year? Was this a classroom aid? The quilting in the alternate blocks and borders is beautiful. Cream thread on the blue fabric throughout the quilt. 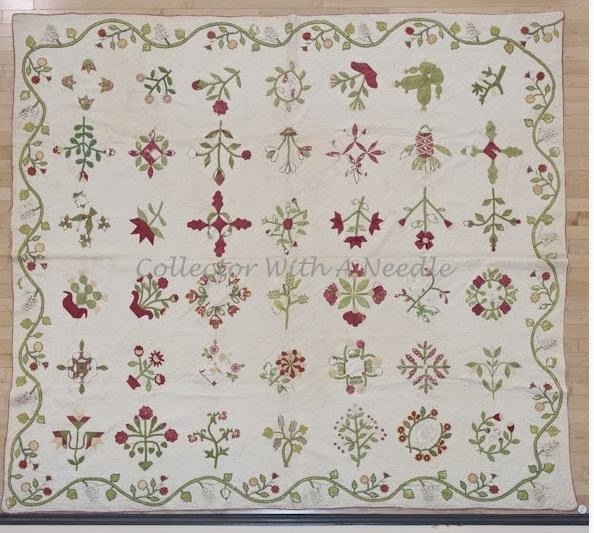 The embroidered blocks have single line diagonal quilting. The borders are quilted in cables. The quilt is in excellent condition. No hanging sleeve or signs it was hung. Let me know if you would like to see any of the other blocks up close and I will send you pictures. 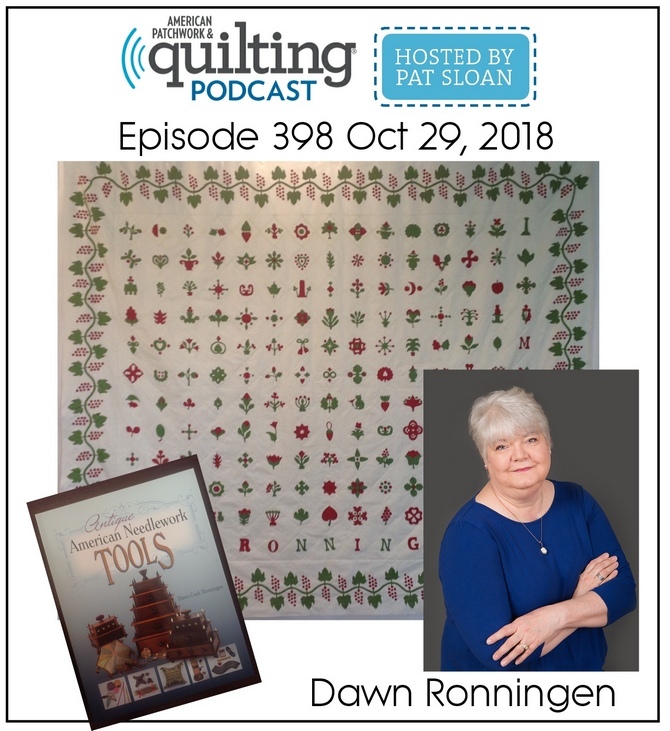 Have you used a quilt in a non-quilt classroom? Have you done any blue work? UPDATE: Thanks to a reader the pattern has been identified! 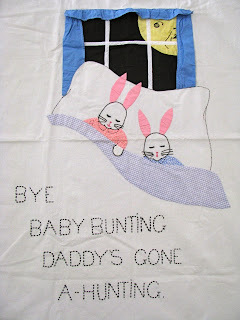 "The Sunday Plain Dealer has arranged to give its readers a service that will make special appeal to the boys and girls as well as to their mothers and grandmothers, and we’re pretty sure that father and the baby too, will like the finished result. "This is the Colonial History Quilt, designed especially for a boy’s bed, but girls who love stories of heroes may make it for themselves. If grandmother decides to make it for that lad, it will become an heirloom, a thing of joy and beauty to be used and treasured for years." 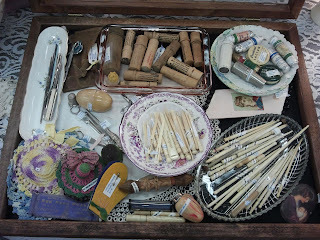 I had a great day out antique shopping - thought I would share some pictures. The pink stripe sashing on this quilt top caught my attention. 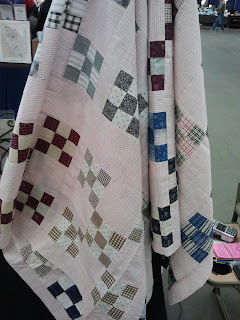 The nine patch blocks are in groups of 5 by color, alternating with pink stripe blocks...add pink sashing. You can never have too many pink stripes! This booth had a wonderful mix of transfer ware, lace and sewing treasures. This pin cushion had some type of metal gasket to attach it to something - rather odd, but a nice brown velvet. The sewing box is three levels - two level are more common. Oddly, it only has two thread holes on the side top. That, along with the gap at the top makes me wonder about inaccurate repairs. 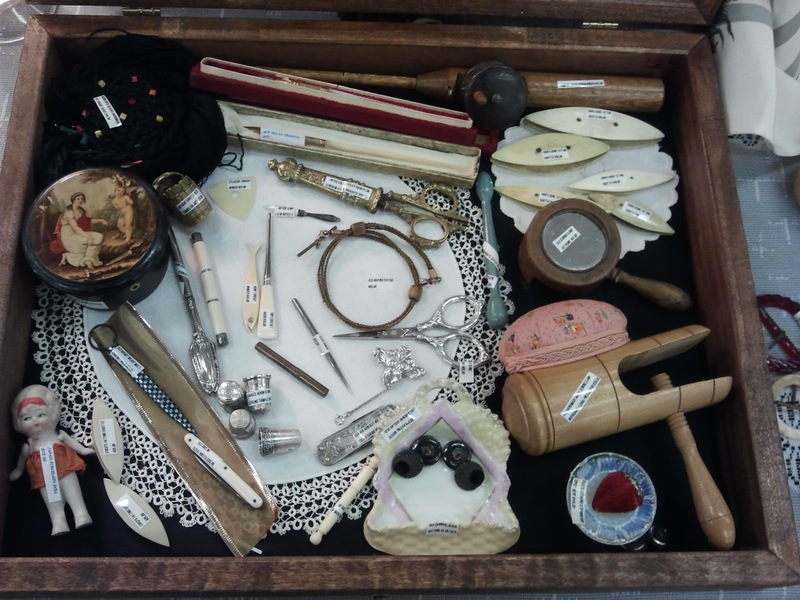 Case goods/small items are fun to look through. 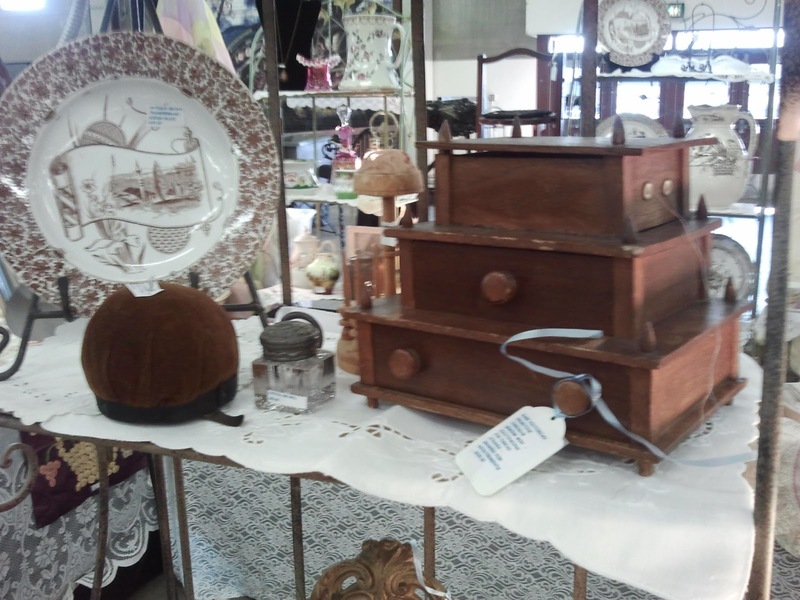 Effective use of small transfer ware plates for display. A mass quantity of carved bone implements. This case has some nice sterling pieces. The mother of pearl game pieces were interesting to look through. 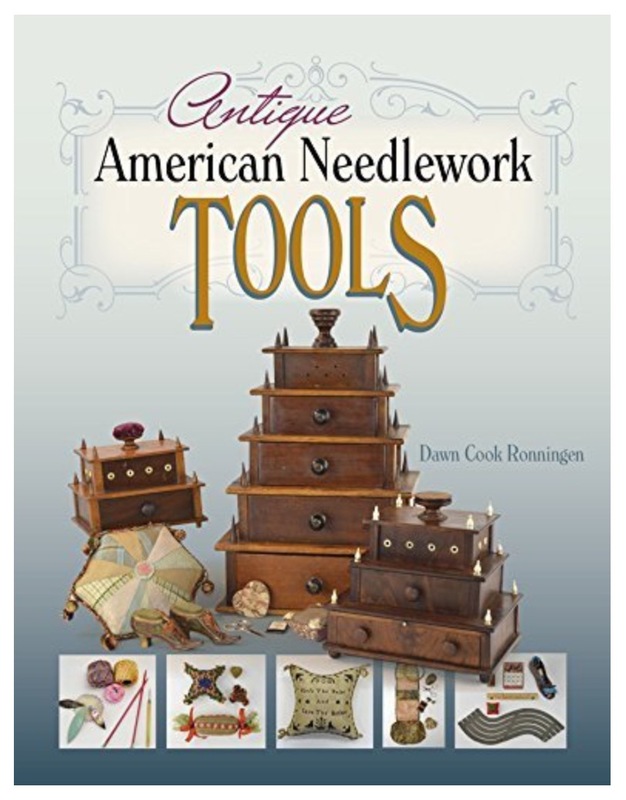 I bought the bone pin cushion clamps in the upper left corner. 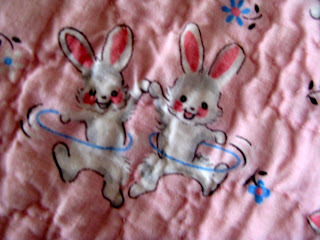 I also bought a couple quilts, but you have to wait to see those! I'm writing a separate post on those. 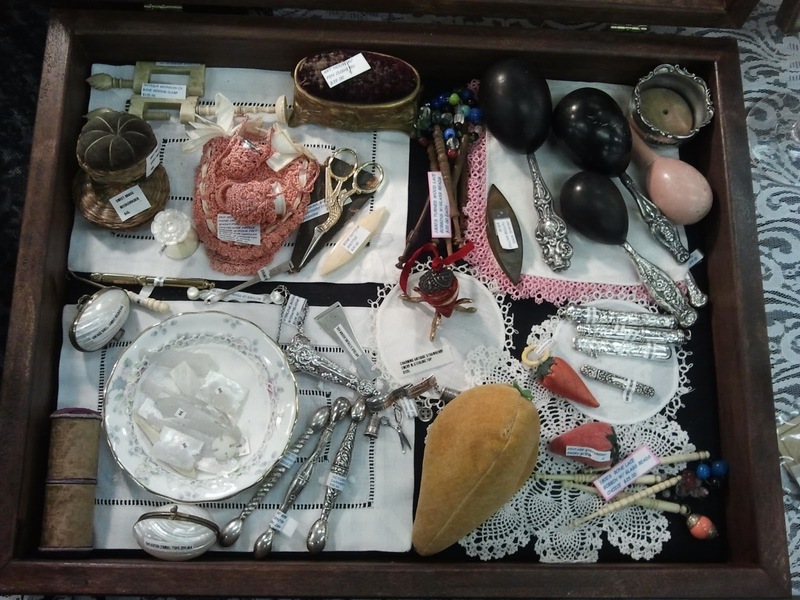 I hope you enjoyed a look at the antique show.